My dog is an obstinate, awkward, devious, occasionally spiteful, deaf-when-he-wants-to-be pain in the bum. I think he learned at least some of these traits from me. 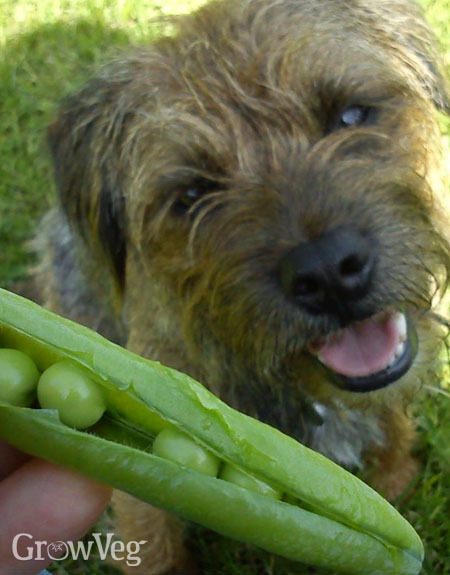 I know for sure he watches me closely and copies other things I do – like ‘harvesting’ pea pods, for instance. Grrr! Failing that, a low fence may do the trick. Whenever my back was turned Bracken would help himself to whatever fresh produce he fancied, from rocket to radishes, until I put a knee-high fence around my veg patch. He can easily jump the fence, but for the most part he respects it as a line he must not cross. Persistent digging is an activity often complained about by dog owners. It’s always better to reward good behaviour than punish bad, so if you have space the easiest option could simply be to assign Mutley his own area where he’s allowed to dig. Some people hide toys in a sandpit (which is no longer used by children obviously!). This reinforces the idea that digging in that spot is more rewarding than digging elsewhere. Be aware that some common garden plants can be harmful to dogs – for instance daffodil bulbs, Bergenia(elephant’s ears) and yew are highly toxic to dogs, should they be so inclined to eat them.